Instead of spending up to or over $1,000 to upgrade my motherboard, processor, and power supply in order to buy the latest generation of PCI-e cards, I decided to stay with my current system and get the latest and fastest AGP solution available. Since ATI just released their new Radeon X1950 Pro cards which supports AGP, I decided to give one a spin. 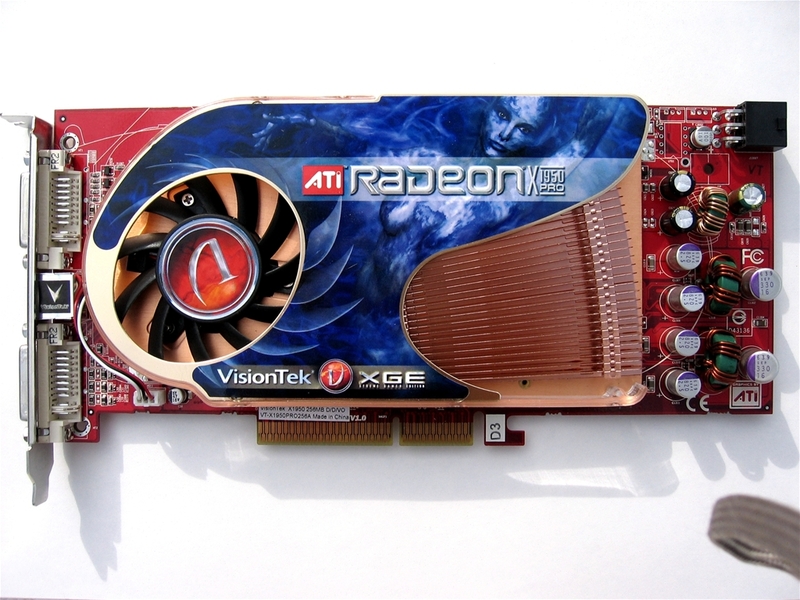 This is where the Visiontek XGE Radeon X1950 Pro 256MB card (MSRP: $300) comes in. It has AGP, has a bit of legroom for future gaming, and it allows me to get instant gaming satisfaction until I can come up with the funds to get a whole new system. So is the X1950 Pro AGP the answer to gamers who want to stay with AGP for a bit longer? 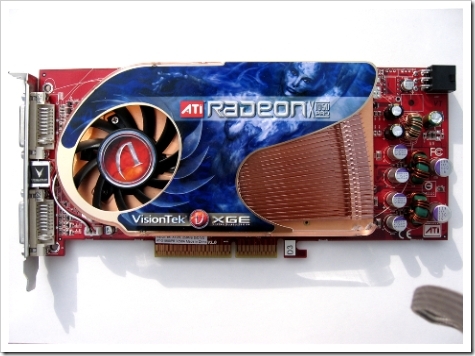 Read on to find out in this review of Visiontek’s XGE X1950 Pro 256MB video card. First impressions of the card once unpacked was that the card is pretty heavy. In fact I’ve reviewed dozens of video cards over the years, and this is likely the heaviest one I’ve encountered. This is in no small part due to the oversized fully copper heatsink mounted onto the board. More on the cooling solution later. On top of the weight, I’ve noticed the card is pretty long, and some people may have difficulties sliding it into their case. You may have to move wires, and in some cases, locations of your hard drive(s). If you’d like to be sure, you’ll need 9 inches (9″) of length in your case. I was also glad to see it is a single slot solution, rather than taking up two slots in your case. It has two DVI-I ports, but don’t worry if you still use VGA, it comes with a DVI-to-VGA converter. Thrown into the mix is an adapter for component HDTV hookup, so you can plug it into a HDTV for high definition 1080p love. One of the features of this card is called AVIVO, a video platform by ATI that enhances video capabilities. It allows for the hardware on the video card to encode and decode H.264 formatted video (Blu-ray and HD-DVD both support this format), which allows for smooth display of high definition content. Since it is done on the GPU, it aids the decoding of supported formats/codecs, thus lowering CPU usage. This is especially useful for media PC’s. Get helpful demos for gre test, cissp tutorial from 70-451 with 100% guaranteed success. Our best quality braindumps like MB2-631, ccda dumps, mcdst dumps and 646-671 dumps is a great deal. Would have been nice to see it compared to Nvidia fastest AGP the Gainward 7800gs (7900gt 512mb 24/8 ) as in the forums this seems to be what people want to see is it King of AGP or not…….. also showing it as an upgrade from an old GPU was not that helpfull. If I had a 7800GS lying around, I would’ve certainly benchmarked it for this review. But if I wasn’t able to upgrade a whole new system for PCI-e, I definitely can’t afford to buy two video cards. I’m just a blogger giving my thoughts on the X1950 Pro, not a dedicated review site. However, from what I’ve seen on other sites, the X1950 Pro looks to be king, beating the 7800GS handily in most benchmarks, except in Doom 3-based games. Could be the 6 pin power adapter inside board packaging replaced by one of my thermaltake 750 watts 6 pin PCI-E conector without fry the board? I am afraid that trying improve cable managament finish damaging the new X1950 pro AGP. Angel: I don’t see why you couldn’t, as the 6-pin connector was made for a PCI-e power connector, even though this is an AGP card. For those who don’t have one, the adapter works fine, too. I used the 6 pin connector from my PS with no problems. I did upgrade my 350W PS to a 600W PS though. Thanks yet again Matt. My son’s X800XT died on Saturday and having read your review already I went straight out and bought a Sapphire AGP X1950Pro. Absolutely everything you said is spot on. I reckon it’s a tad faster than the 7800GS but I haven’t actually benchmarked it. No faster than a year and half old ATI x850xtpe. But it is cheaper and has up to date SM 3.0. Gboy: Keep in mind the card can go much faster if I were to have a faster CPU. Right now my processor is limiting the performance of the X1950 Pro, which is why the AA/AF results are more indicative of this card’s strengths. I’m not certain of the performance of the x850xtpe, but I’m certain the X1950 Pro would outperform it when the CPU isn’t a factor. that’s funny horai, my X800XT died last night. Now i’m looking at the 1950s. I preordered a diamond x1950 pro w/512mb from amazon last night. Robby, I can certainly agree with Matt’s recommendation, the 512Mb version is a hell of a lot faster than my old X850XT and will quite happily play F.E.A.R at 1280 x 1024 on an old P4 2.8Ghz system. My findings and feelings were about the same as yours ..So I too returned the Visiontek to BB , I love that store! This is from one of the many reviews on the web..This is a much better card than the Visiontek , as the “black sheep ” of the herd.. If you would of chosen the x850xtpe and not the $50 less x850xt , would of saved $300 today.. When you play games ,what most important you?? Its not the MAX fps,, anything over 30fps (movie speed) is playable.. Its the MIN fps is that counts..low fps makes your game look like a slide show..
And the better gamer is the one with higher MIN fps.. So look at the MIN fps , not the MAX fps !!!! This info may not be so easy to find in reveiws..
“Cause you don’t bite the hand that feeds you ” !! I think you meant to say in the HL2 benchmark notes that the X1950 Pro was run with 6x AA, as ATi cards (outside of Crossfire) don’t support 8x AA. Also, the graph key color doesn’t match the graph. Man thanks for the review I now am the proud parent of a visiontek x1950 agp it kicks my old radeon x800xl out of the water. Iron Tiger: Woops, you’re right, not sure how that slipped in there. I’ve corrected the AA. As for the legend color key, that’s my inexperience with spreadsheets showing through. The program was a nightmare for me to crank out graphs. 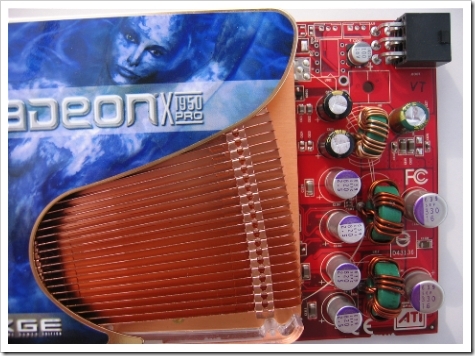 i run my visiontek radeon x1950 on430watt power supply,,everything seem to be fine. Like you trying to hold onto a socket 478 system a little longer. Just upgraded the P4 2.6 to a P4 3.0 and now looking to upgrade the 9800PRO 128 to this card. If I can run my 9800PRO I’ll assume there should be no issues with the X1950? Correct? Running a 450W OCZ Modstream PS. jaxstraww: X1950 Pro will require more power than the 9800 Pro but your PSU is a good one, so it should be fine. Now the 7800GS does come close to some test with the X1950 Pro, but I think the X1950 Pro will beat all of the 7800 GS series in most bench marks. Man thank you for the review help me deside from the X1650 and the X1950 im running a 3200 Barton O/C 2gig memorie on a ABIT AT7 MAX2 and want to keep for a long time so now i can so thank you again. The card is on its way. :) will post what i think of it . Anyone have any guesses on how this GPU would perform on an Athlon XP 1900 (don’t laugh – I’ve gamed on this machine for over three years and it still gets by!)? I know that the CPU would be a huge bottleneck to the full performance of this card. BUT I am definitely going to spend up to $250 to hold on to my current system for another 6 months to a year until I build a complete new PCI-e based system. And for the people that are going to suggest just spending the money on upgrading instead to a PCI-e motherboard – there is no upgrade solution for under $250 dollars that I have found. As I am looking at having to get a new CPU, RAM, and GPU if I go that route… It is almost impossible to find Athlon CPUs for a reasonable amount as well, closing off another route of upgrading. I’m really stuck. Any constructive advice would be greatly appreciated. Just remember, I am only willing to spend ~$250 at most to get a little more life out of my system until I can afford building a completely new system. These are correct! The cat 6.14 drivers work better for real world performance, but don’t seem to like 3DMark2005 as much. Just goes to show the value of synthetic benchmarks. The 6.14s work far better for FSx. Athlon64 3000 Newcastle (200FSB x 10. 512 L2) – OC to 220. Im a huge ATI fan and thus i wanna stay ATI. My question to you is whether it is worth for me to upgrade my pc by jus buying a X1950 Pro on agp or should i rather save abit longer and uprade to a whole new PCI-E system? 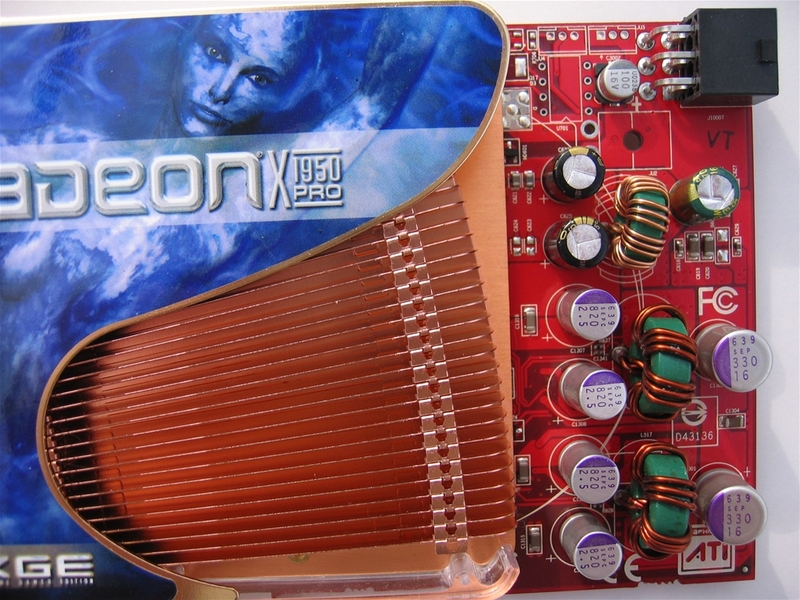 I’m truly interested to get this card… the real concern being the length of the 1950agp, my current HIS IceQ 800xtpe barely scrape through(touching the ends of my ide cables) in an old thermaltake xaser casing. Can any1 out there pls advise whether the 1950 can fit in my casing. cm per cm/ inch per inch, what’s the length of the 800xtpe compared to 1950 agp? I have an HP media center computer and found that the card would not seated because it was too long and hit the motherboard power connector. I had a couple of old supplies around so I took a finishing nail whose diameter matched the width of the graphics card, heated it up on the gas stove with a pair of pliers, and worked it down between the wires on the power connector where the graphics card was hitting. The test worked so I disconnected the power connector from my mother board and clamped it to the tower for a steady fixture. I then heated the nail and carefully worked it back and forth between the wires in the molex connector. It only took about several iterations to get enough material remove (grove depth) for the card to seat. The plastic in the molex connector conformed well and actually built up a nice layer of material between the wires and the groove and none of the wires were damaged. I have been using the computer since with no problems; just be careful, have a good setup, and take your time. Again scrounge up an old supply to practice on it to see if you are up to the challenge. This card kicks my XFX Geforce 6800GT out of the water. Nice upgrade for my origional Dell XPS for which ive had for 4 years now and it still delivers great gaming performance ( P4 HT 3.0 GHZ, 2 Gigs of DDR400ram ). I recon ill be good for another 1 or 2 years now ^_^ Thanks for the great review. Super card sapphire 1950 pro, just the ticket to extend my s478 rig to beginning of 08 when native quad core from intel, hyper-transport3, Pci-e 2 ,second generation Dx10 cards and a service pack one for vista ,with decent Dx10 titles out. Clocks well on core to 645 from 580, memory does not budge though from stock 702.
i have a question, (i’m not a pro with computers so sorry if what i am asking is really stupid) i own a Be quiet power supply, moder BQT P4 350W S1,3 that provides 18A / 216w to the 12V line. At the beginnig of the review you said that the minimum recommended would be a 450W psu with 18A. In a pcCity branch they told me it’ll probably be enough (although i don’t know if his recommendation came from the prospect that he could sell me the card and a few days later a PSU…) so i would like to have an informed oppinion if this could work, and what would be the worst that could happen if the card is to power hungry for the psu. Also if there is some information on the documentation of the card regarding minimum power consumption, voltage, wattage, ect. i would really appreciate the info. 350 watt power supply is a little short of the mark, It all depends on how much it has to power, MOBO, Processor, Memory, Hard Drives/s CD/DVD drives Fans Sound Cards ect..
benchmark. Replaced PSU with Jeantec artic 600w with 19a on each 12v rail (Four in total) allowing for a total over both molex connectors of 40a, Now it works and goes like stink. The theory is, if you have a really good quality 350w power supply and few demands on it then it may suffice, so plug it in and try running it, but be prepared to fork out at least 70 pounds for a replacement power supply if it does not. It is worth it though as you will be getting a power supply that will move forward on to your next gen machine. The min specs are 450w with 30a over two rails hence two molex connectors, ps more amps mean less heat and stress on the card and better overclocking room. Nec 3500AG dual layer dvd burner. It is a bit painfull to realize the upgrade path is a little dearer than expected. What you have not mentioned is what card are you currently running in your system, I was running a good leadtek 6800 which was by no means a slouch and very playable, I just cant live with dropped frame rates, drives me insane. The essence is that if you are a serious gamer and want to hold out for the correct upgrade in early 08 to newer better and faster technologies out around then, buying the agp 1950 is a good value year long happiness inducing piece of kit. The sapphire card is a good one and looking at your machines specs (Similar to mine but better and more ram and super cool raptor) it will run very well. There is room for overclocking it if you are in to that sort of thing, but will not make much noticable difference, only a higher 3d score for kudos rights. I have found that the p4 is holding back the performance now as this is acting as a throttle. I clocked my 2.8ghz (1meg cache 800 fsb) to 3.2ghz last night and ran 3d05 scoring 500 points more than standard clock, I do get that increase by overclocking the 1950 even by 50mhz. The sapphire uses 2 molex connectors as there are few if any power supplies out there with over 30a on a single molex, hence using two molex connectors in parallel gives the required amps. By the way, the 1950 uses more amps that the big daddy nVidia 8800gtx, Go Figure. I think its a worthwile upgrade, and feel I have spent my money well, Definately not buying ps3 now as will be too busy fragging on the pc. on beach mark from freestone in got 2210 that is 64bit performance. YAHOO. I just recently bought a HIS Radeon X 1950 PRO card, and it mentions about the 6 pin power connector, i looked al threw my computer and i cannot find a 6 pin wire anywhere, i also bought a new MB and yeah i cannot find a 6 pin anywhere PLEASE HELP ME!! you need a powersuply with the plug or a adaptor that goes to normal hard drive power to that 6pin connector dont you have the plug in you video card box? with mine i did have it. I just bought this card as well, and I hate to say that it is not living up to my expectations :( I cant get the catalyst control center to work at all, and it plays my nascar2003 game and rFactor worse than my 6800gt that I had. I’m hoping that I just have something set wrong but I’m not sure. Have the 6 pin connector from my 500w PSU connected….any ideas? Could it still be a power issue? Im having the same problem. Agp is always turned off in smartgart and there is no way to turn it on. i used to own a 9800pro and that card was always stuck in 4x agp till i updated my chiset tdrivers for my motherboard,so im gona do that now and see if it works. Mine is at off too but its running a 8X i know because of my speed test there is no way that i would have test like this with no 8X on . so i dont bother about it. It’s an Antec SP450 watts. As you can see it has a 12V1 with 15 amperes and a 12V2 with 17 amperes. That means the amperes of both 12v will sum up when using the 6 ping connector? Sorry I’m a little lost with this matter and thanks. I have a system (dual 3.6 xeon) with agp and use it for tivo with an ATI theater card. I was using a BFG7800oc but it didn’t play nice with the theater card soooo bought one of these ATI 1950 pro cards. It works with the theater card much better and seems faster than the 7800. I run Vista 64 bit so I cannot bench with 3dmark as they don’t support my OS but the Vista gaming graphics performance came up from 5.2 to 5.8. If you know of any benchmarks that run on Vista 64, I am willing to swap cards around and run them. and at 3.4GHz CPU O/C for 3 months now in the hottest of weather in an air cooled rig. This card is big ,but is a brilliant performer as long as you have the power and the air flow for it. Currently the card is O/Ced to 621Mhz core and 702 MHz mem. Ok, i was all set on going PCI-E then i literally stumbled across the scoop on this card for the agp format and i got thinking…maybe…just maybe. One thing though, i remember when i was considering the 7800gs the PSU was a bit of a grey zone for me. And if it were to go into my system, what kind of performance increase do you think i could expect over the faithful 9800pro i have in there now? I thought I’d assist people with PC requirements for this card! The card sucked in this PC. As you will have read above though, there are some benfits for those with older rigs like the one above, the MINIMUM frame rates are at least a lots better than the out going X800XT, plus FSAA and AF could be applied with minimal performance hit. However, if you do upgrade, then you really do get at least twice the power from the card. I can only urge anyone with less than DRR2 and minimum top end single core Athlon 64, upgrade! You will be so so happy! The thing is that in order to get the best out of your 1950Pro your sys need to be inline with your GC.If you had older system it will bottleneck which mean that you wont see much differences if you use new high-end GC compare to your older one. ЧТО вы будете делать этим летом??! не вмешивайся в английский раздел.. тута американцы…. PS ONe last thing for now 7.7 drivers work the best for my system…P4P800E Deluxe/ 3-160Hds/2Gigs of Ram/Prescott 3.0 over clocked to 3.6 ghz /creative X-fi sound card./six fans. Anyone have an opinion on the 256Meg memory of the Visiontek versus the 512 on the diamond/sapphire/HIS cards that are out there? I noted that the HIS card doesnt include the 6 pin MOLEX adapter for instance…any other comments on comparing the different builds of the x1950 chip? Im looking for more stable What catalyst Software and drivers for ATI RADEON Visiontek X1950 Pro AGP? hey there and thanks to your info ? I’ve certainly picked up anything new from proper here. I did on the other hand expertise some technical issues the use of this website, as I experienced to reload the site lots of occasions prior to I may just get it to load properly. I have been puzzling over if your hosting is OK? Not that I am complaining, but slow loading circumstances occasions will sometimes affect your placement in google and could harm your high-quality score if advertising and marketing with Adwords. Well I am including this RSS to my email and could look out for a lot more of your respective interesting content. Make sure you replace this once more very soon..